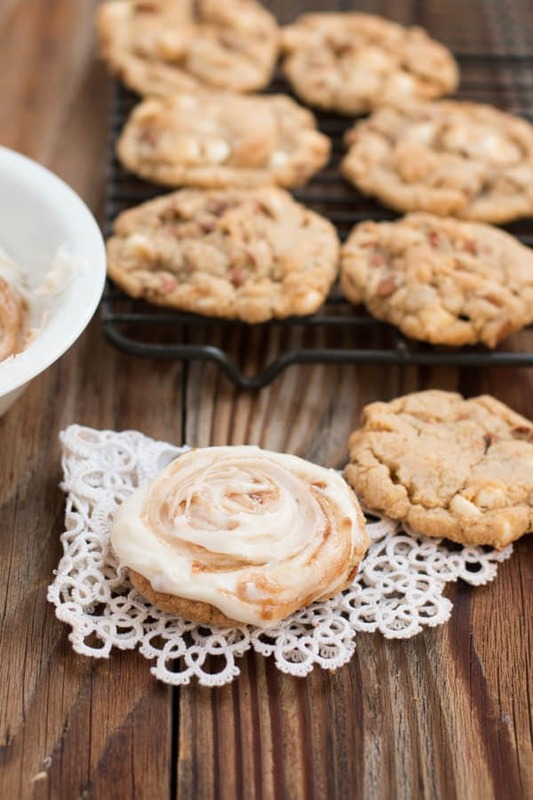 You haven’t lived until you’ve had these cinnamon roll cookies. You don’t have to spend hours making cinnamon rolls, just make cookies. This post for cinnamon roll cookies is a little different because I’m sharing another story from my darling Grandma. 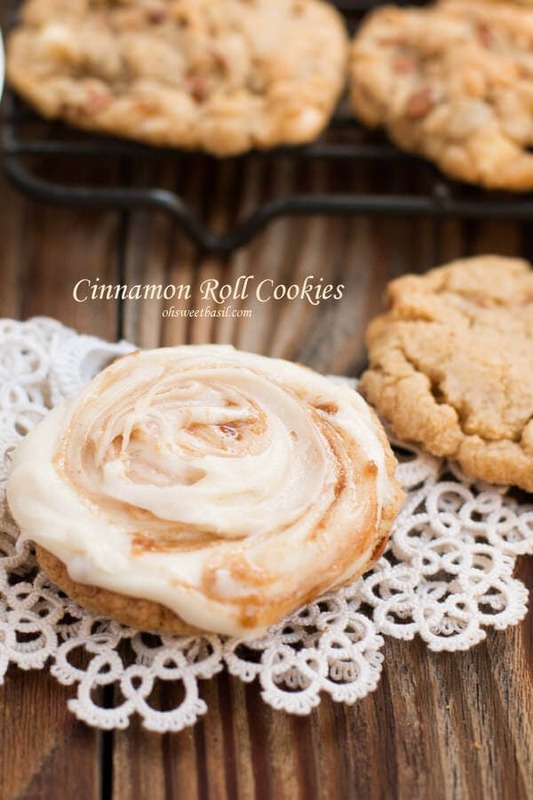 I adapted the recipe from Picky Palate’s snicker doodle like cookie because I was dying to try them but then I got crazy and changed it into a cinnamon roll cookie thanks to the cinnamon roll frosting from yesterday. These are the cinnamon chips we use. I buy a few bags when the holidays hit to last throughout the year, but this year I had to buy 8 packs through Amazon. Yes, I do that because this Churro Chex Mix and Banana Snickerdoodle Cake are amazing. Anyway, her sister suffered a stroke and as she has been so sad. I hate that we all have to get older and go through so much. Grandma has spent almost an entire 90 years just loving on others and being all kinds of wonderful and I want to make sure that others get to know her. She has such amazing stories and we are so lucky to have a book that she wrote from her life. This story is one of my favorites, but the outhouse is pretty up there as well. And if you’d like to read more of our favorite stories here are a couple in these posts for, Heirloom Apple Rolls, and Grandpa’s Famous BBQ Pork. So, on with the story!! ” Our school was just a small country school so we knew everyone and were usually friends with everybody. I had a cousin in my grade who used to go out of his way to tease and needle me. Every time I turned around he pulled some mean little trick to make me look silly in front of my friends. We took him and his sisters to school in our sleigh but they always made us late because they were never really on time. Oh, how I hated to be late. My feelings toward my cousin were therefore, never really friendly. Maybe that’s why he was mean to me. During my young years, I was quiet and shy, but there was a bit of mischief tucked up inside of me. One day, my cousin pulled every trick imaginable to make me miserable. No matter how hard I tried to stay away from him he popped up out of nowhere. I could almost see horns sprout, and that devilish grin made me so nervous. I was always wondering what was coming next. I decided that I had had enough. I had a piece of chocolate ex-lax (laxative) in my pencil box. It looked like a delicious piece of candy except it said “ex-lax” on the top of it. I took my little scissors out of my desk and ever so carefully scraped those revealing letters off. At recess I sneaked the laxative out of the box and ran out to the playground. My cousin wasn’t hard to find because it seemed as if there were always a dozen of him–lurking by the swings or giant stride or slide, grinning and announcing what color bloomers I was wearing. Ohhhhhh! I’ll get even with him today! I walked up to him so sweetly and said, “I’ll give you a piece of candy if you’ll be my friend and not tease me anymore.” What a trusting, gullible boy! He swallowed the line and the laxative in one gulp. Gosh, I didn’t really think he would do it so easily. I felt pretty smug and wondered if he’d feel like grinning tomorrow. The next day I was the one grinning. Every time my cousin held two fingers up to be excused from class I was so happy inside. It was all I could do to keep from laughing out loud, but of course that would have given it away. 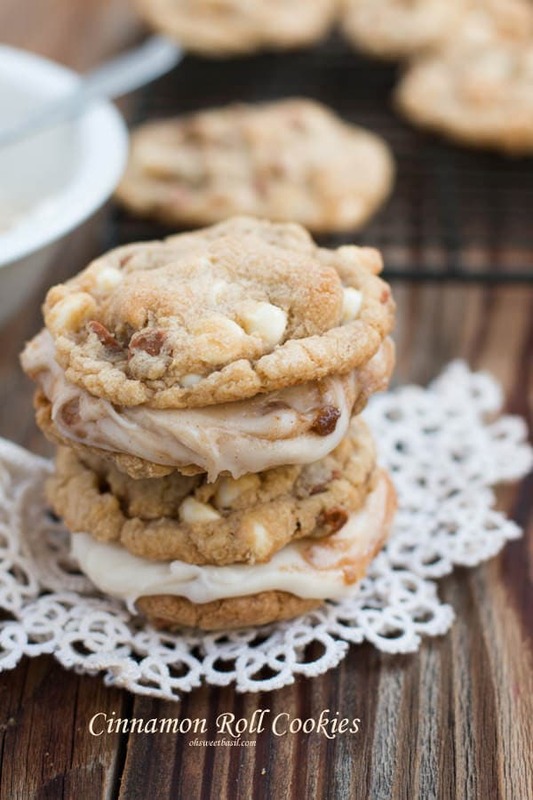 You haven't lived until you've had these cinnamon roll cookies. You don't have to spend hours making cinnamon rolls, just make cookies. In a mixer, combine the sugars, and butter. Mix for 1 minute then add the vanilla and egg and mix for another 15 seconds. In a small bowl, whisk together the flour, pudding, baking soda and cinnamon. Mix for 30 seconds and add the cinnamon and white chocolate chips. Scoop out the dough onto the baking sheet and bake for 10 minutes. Meanwhile, make the cinnamon roll frosting. 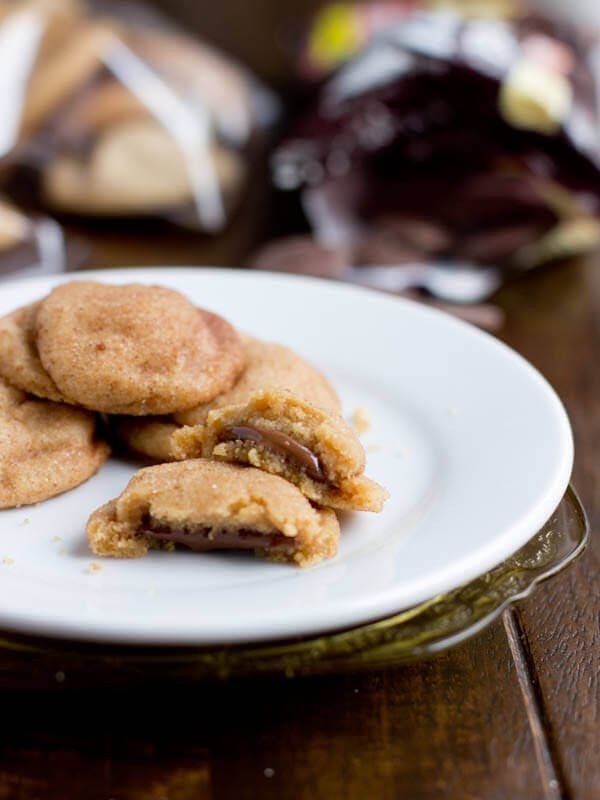 Remove the cookies from the oven and allow to cool and frost, or frost and top with another cookie! 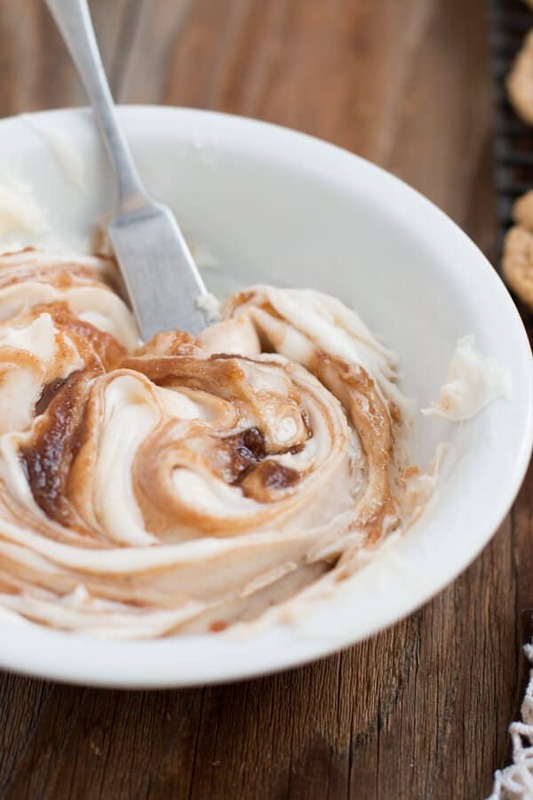 The frosting that tastes like an actual cinnamon roll. These look amazing. I never saw cinnamon chips . Where do you get them? Hi Carol! The cinnamon chips can be hard to find! I have found them at Target and Winco here in Utah. They are much easier to find around the holidays. When I see them, I buy like 10 bags. If you can’t find them at the grocery store, I know you can buy them on Amazon. They are made by Hershey’s. What a genius idea! They are so delicious and have such a unique flavor. I misunderstood and used pre-made vanilla pudding, like in the Snackpacks (not powder), and they turned out delicious. Honestly, I think it just made them more chewy and moist. Now I’ve done it both ways, and they’re always delicious. LOVE this recipe. Whhhaaaattt?!?! That is amazing! Now I want to try it your way! Hi the recipe sounds dreamy, I just wanted to ask – the puding is powder or cooked? Also could you put it a link for the cinnamon chips? I have never heard of them. Thanx and Merry Christmas! Hi i would like to make these cookies but i cant get my hands on baking soda atm what can i use instead? Hi Basil 🙂 I have some questions, how many grams has the stick of butter, I live in Europe, here is 250gr the packet, and also the French vanilla powder, does it have to be french? I cannot seem to find any, just vanilla pudding powder will do, right?thank you. Hi Gina, yes the vanilla will be just fine. You could really do any flavor you want. It should be 113 grams for a stick of butter. Interesting, 113g the butter, I don’t have kitchen scale so I’ll have to guess it. I will try to do this beauties for Christmas, I will let you know what came out. I wanted tp try ur coikies vut couldnt get my hands pn any baking sodasubtitute it for?? I wish I read everyone’s comments, I bought actual pudding. Can that step be skipped or is it an important part of the cookie? 1) can you confirm if the recipe calls for pudding I stand powder or a premade pudding pack? Hi Alexis! You’ll want to use an instant pudding powder. Just rip open the packet and measure out the powder. Yes, after whisking the dry ingredients you mix in the wet. We updated the plugin so it should show it all now. Just wanted to drop you a note and let you know much we loved these cookies and frosting. Took me awhile to get to them to make but they turned out super. So good my husband is telling everyone all about them and I have shared the recipe with many. 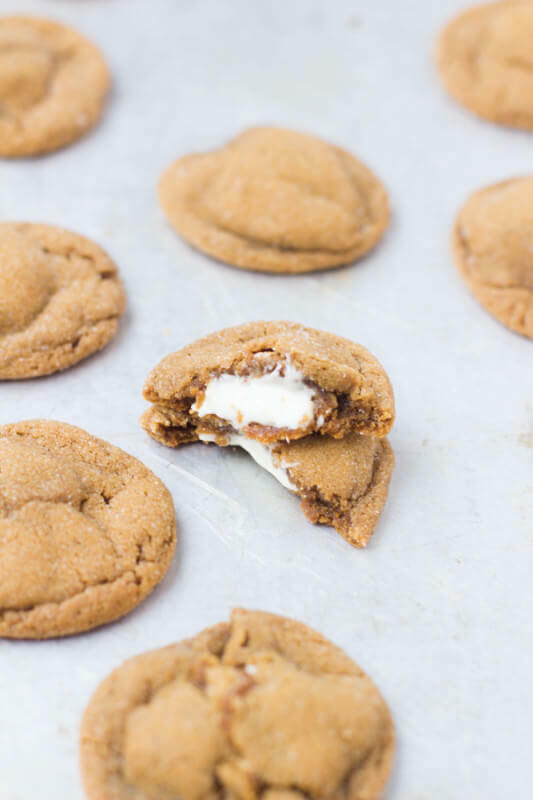 This ranks up at the top of my cookie list and I have made lots. Thank you for sharing with us. I’ve never seen cinnamon chips..not sure where to get them? ?Do these freeze well?? You can order them from King Arthur Flour. And I actually bought some today at Wegman’s. Totally gorgeous cookies and I love the story too! It’s so wonderful that your grandma took the time to write down some of the stories of her life, what a treasure for you! It’s something I never realized I would treasure so much. Thank you! Reminds me of my dad and a guy at his work who used to raid the lunchboxes at his work for goodies like candy bars. Dad got fed up and painted the back of a Hershey bar with melted ex-lax. The guy never filched treats from other lunches again! Lol! I would like to receive your recipes. They look scrumptious. That’s such a funny story! I can totally see my mom doing something like that. Love these! I hate it when people ask stupid questions….but now it’s my turn! 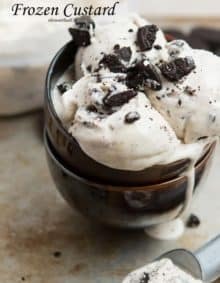 Do you use pudding that is already made or powdered pudding mix? I can’t wait to try these! Mine turned out really flat too and I used the instant pudding powder, so I’m not sure what happened 🙁 I measured everything correctly. I may try again with heaping the flour and chilling the dough prior to baking. Hmmm, how warm is the fat you are using? You can always use shortening instead of butter to help them be fluffy, mixing the sugar and fat longer. We’ve made them a few times and I haven’t had them turn out flat, but I’m a big believer in really creaming that sugar to help build up the cookie. These look absolutely heavenly!!! I can’t wait to share them with my faves from the week this Friday morning @ http://www.makingitinthemountains.com! Kristi, that is so sweet of you! Thank you!! 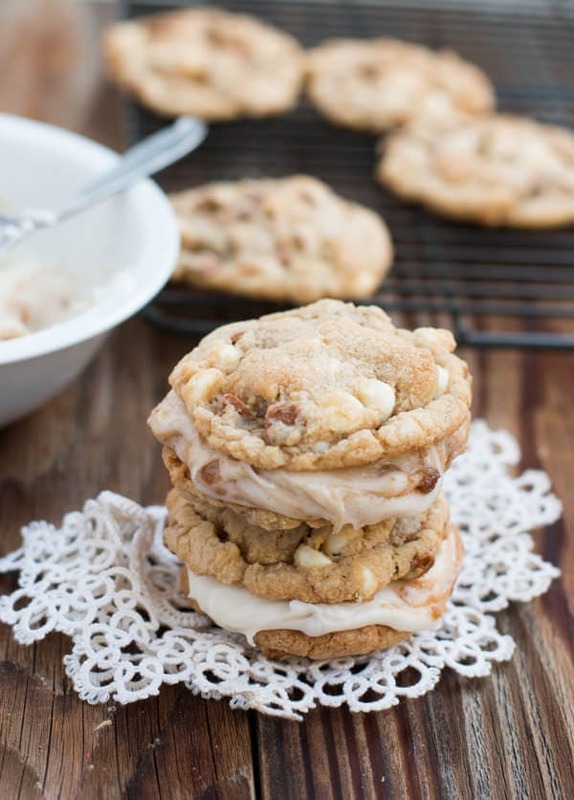 I’ve seen cookie dough stuffed cinnamon rolls but this is even better! Look at that fantastic frosting. haha, isn’t she the best??! Carrian, these look absolutely delicious! I had to chuckle at your Grandma’s story:) Thanks for sharing a small part of her with us! she’s such a sweet lady. Thanks Heather! Saw these on G+ today! Yummy! 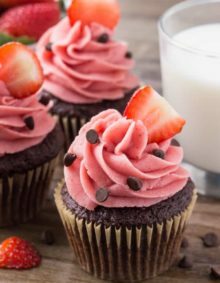 I cannot get the link to the frosting to work? It says page cannot be found. Can you post it or email it to me. Thanks. I cannot wait to make these!!! Wow even the quiet country girl played tricks now and again. Did he ever find out it was you? 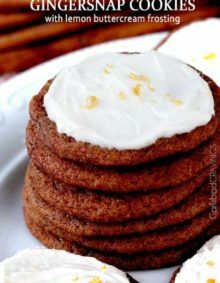 These cinnamon cookies look delightful and I am printing the recipe and yes passing it on to my wife. Before everyone jumps on me for making my wife make these, she loves to bake and trust me doesn’t allow me in the/her kitchen!